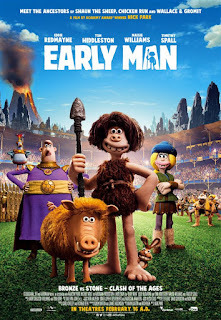 Somewhat awkward and clunky, Aardman's latest, about a soccer match between a group of cavemen and a more advanced Bronze Age society, gets charming at the end but still feels a bit haphazard. Early Man (an awkward title) starts with a rushed set up. We follow a tribe of cavemen (with an implication of dinosaurs?? really?? in 2018 we still put cavemen next to dinosaurs) who invent soccer by evolving what is essentially hot potato with a meteorite. Sure it's clever but the next piece feels less clever and more obvious. Generations later the tribe is hunting rabbits and encounters a more advanced society. Their clash of cultures is cliched and filled with lame jokes (including one about sliced bread... *eye roll*). All of this just to get to the meat of the story, the soccer match. Early Man, like many Aardman films, is extremely British. 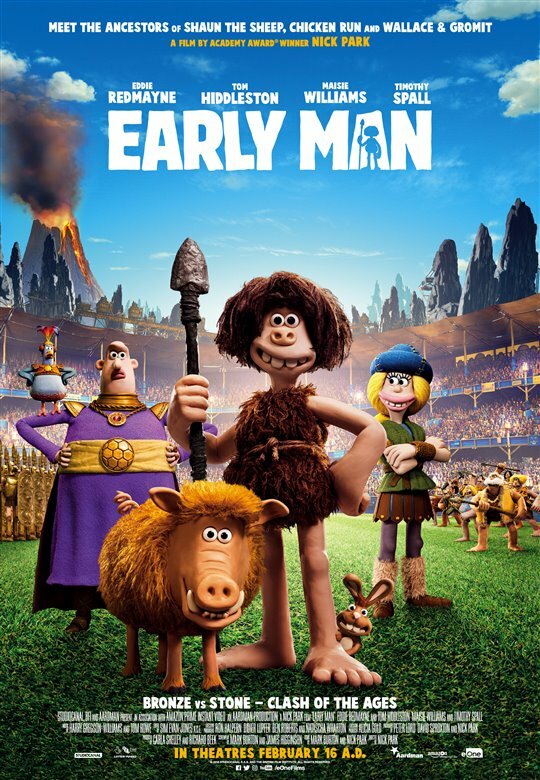 However, unlike their last film, the brilliantly slapstick Shaun the Sheep, Early Man stumbles through most of its story until it gets to the soccer game. It's then the film comes alive and finally starts being entertaining. The jokes remain very culturally specific. Non-brits just won't laugh as hard. But at least it starts being fun. And then, like a lot of stop-motion animation, it just stops and is over. Run times can be challenging for these films and perhaps that's a part of why the plot feels so choppy. So while there are charming moments, especially at the end, overall this is one of Aardman's weaker efforts.